So what of the “original” artwork in this era, and what of the capitalist systems of power and exchange that both support, and are supported by it: the art market? The inherently democratic structure of the internet—its immateriality, its facilitation of mass replication, its free circulation of information—seems at odds with the ownership, discrete object-hood, and specialized knowledge on which the current art market is based. And yet, in recent years, a number of commercial art ventures have set up camp in cyberspace, incorporating digital methods of circulation, representation, and social networking into their business models. 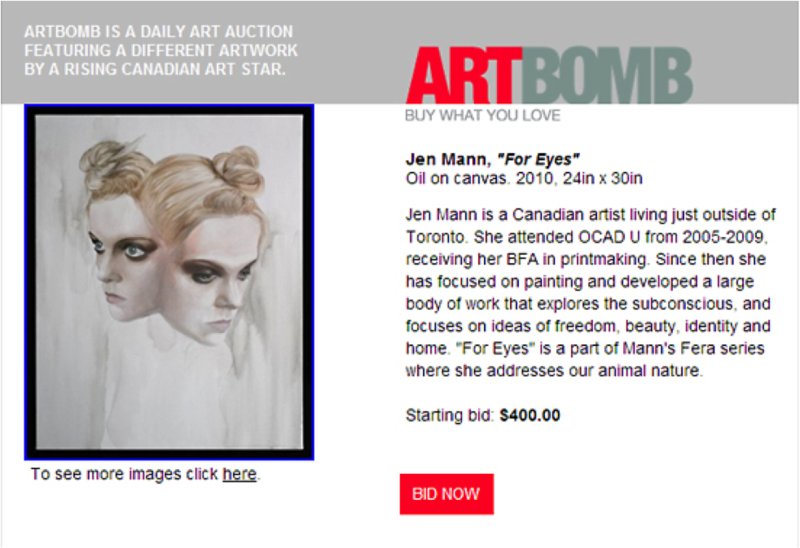 One such project, which emerged this past year in Toronto, is a daily online art auction called ARTBOMB. While the project’s co-founder, Jim Shedden, points to the obvious influence of online companies like WagJag, Groupon, and eBay on their own business model, he cites the general Zeitgeist, “the whole DIY possibility inherent in the web,” as a main source of their inspiration. * ARTBOMB views this eBay/Wikipedia/Napster-saavy generation—one that is steeped in the DIY, communal values that spawned these very projects—as a new market of potential art-buyers. Bypassing the conventional gallery space, ARTBOMB instead delivers images of affordable, contemporary artworks by emerging Toronto-based artists directly to their willing subscribers’ inboxes. From Monday through Friday, a single artwork is auctioned off daily via an online bidding system, and the winning bidder receives the object in the mail shortly thereafter. Like on eBay, the purchaser’s knowledge of the products—material objects ranging from sculptures to paintings to photographs—is limited to a few digital images and a brief description of the artist’s practice. This suggests a new degree of trust in the details provided by a digital photograph in absence of the material counterpart, and perhaps renders less necessary to the purchasing process the specialized knowledge provided by an art consultant or dealer. This undermining of centralized authority is no doubt responsible for part of the hostility from traditional market players towards the strictly online sale of art. ARTBOMB, in their choice of name, clearly acknowledges this confrontational agenda. A second project, s[edition], provides further evidence of the paradox inhabited by contemporary online commercial art projects attempting to bridge two seemingly incompatible systems of value. 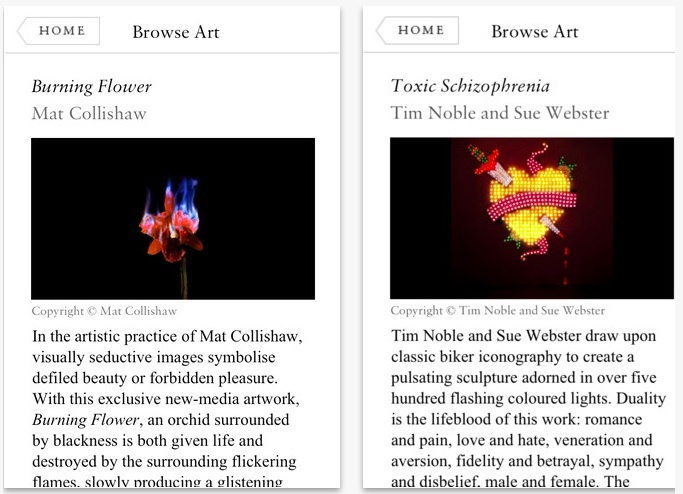 Founded by British art dealer and gallery owner Harry Blain, and former CEO of Saatchi Online, Robert Norton, s[edition] is a self-described, “revolutionary” online marketplace that sells limited edition artworks by well-known contemporary artists like Damien Hirst and Shephard Fairey in a solely digital format. 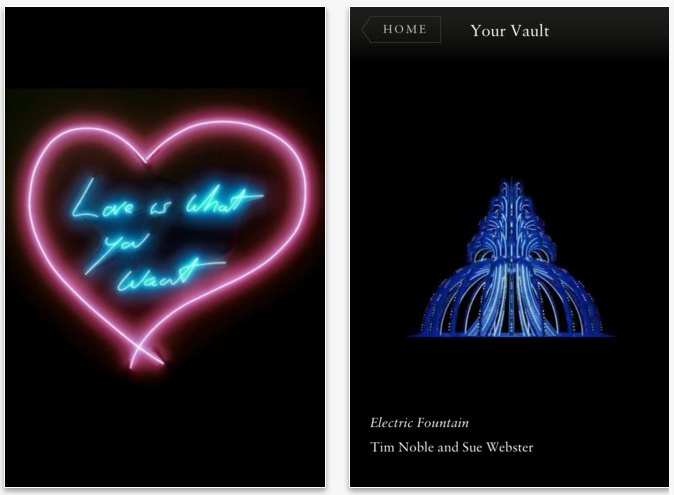 Collectors of this digital art, which consists of both material artworks adapted for digital format as well as works made specifically for the immaterial medium, can store their collection in an online “vault,” and display their pieces on their iPhones, flat screen TVs, and any other digital display devices. While s[edition] is challenging traditional notions of ownership and originality with its dematerialization of the art object into an infinitely replicable digital medium, it simultaneously perpetuates the real-world market structures and systems of value into its new online format. The website is littered with the well-worn, value-inflating terms like “original,” “unique,” and “limited edition”: a language of rarity that appears contradictory to the transient, easily-replicated nature of its subjects. Further exemplifying this paradox, the purchasers of these digital artworks are subsequently mailed a signed certificate of authenticity, which acts as material proof of their newly acquired immaterial property. This draws to mind questions posed by the pseudo-documents/conceptual artworks of the 1970s: works like Gordon Matta-Clark’s Certificate of Authenticity and Ownership, in which the self-reflexive document is the artwork in itself. The two projects discussed here are only a sampling of what will surely be a growing sector attempting to adapt the commercial art market to the digital realm. With claims of accessibility, affordability, democracy, and revolution, these projects simultaneously struggle to control the uncontrollable aspects of the medium, carving out private spaces and negotiating the traditional models of exchange and ownership. These projects occupy a difficult but potentially exciting and necessary position. Their work indicates that a crisis is taking place, one that may herald a new paradigm of the function and valuing of art. Visit the projects at: www.artbombdaily.com and www.seditionart.com. *Shedden, Jim. E-mail interview. 26 April, 2012. This entry was posted in No Category and tagged art collectors, art consultant, art dealership, art market, ARTBOMB, collecting art, Digital Age, digital artwork, Gordon Matta-Clark, Harry Blain, Jim Shedden, Liza Montgomery, online art auctions, representation, Robert Norton, social networking, s[edition], the internet and art, Walter Benjamin. Bookmark the permalink. Please note a correction to your story on ‘The Business of Art in the Digital Age’ – s[edition] does not mail a physical certificate of authenticity. 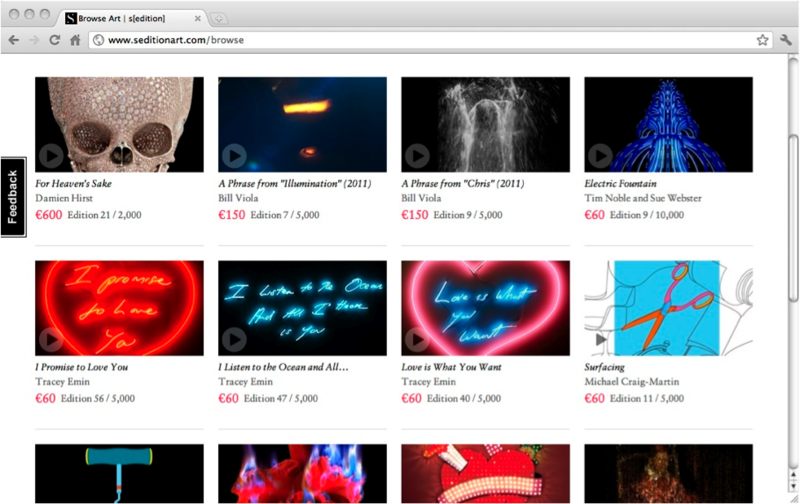 Each artwork sold carries a digital certificate (signed by the artist & s[edition]) that can only be accessed online that records the edition number, the date of purchase and the name of the buyer.